the packing of school lunches! i was just finishing up packing the kids lunches and thought i would write a quick blog while the last of the banana oat muffins were baking! i have been realizing that is mid october and school has been in session for over 6 weeks and i’m doing it! i told myself this summer that with seamus going to school and me having to pack 3 lunches a day (2 kids, 1 husband) that i wanted to move away from plastic baggies. and even though i have been tempted to put it on my shopping list i haven’t! back in the summer i had a mamapedia deal come through my email for re-pac bags, reuseable bags. i bought it! i have 3 of the large ones and 2 of the snack ones. they work great! sandwiches, muffins, fruits, veggies all go in them. i can throw them in the washing machine or i have even washed them in the sink, before i start washing everything else. they dry quick. i would recommend mamapedia/mamasource, i’ve gotten some good deals from them! i also bought two sets of smaller type tupperware (BPA free) on sale at the grocery store. they are the perfect size for cut up fruit and veggies, for the kids. and the others are good for salads and things for geoffrey’s lunch. i did awhile back invest in a set of two good non leaking containers for things like chili and soup for geoffrey. i went through my tupperware/storage containers and weeded out a few that no longer had lids. i keep the sets together and usually have enough clean in the cupboard when i need them. its made a big difference. i have a few that are hard to get the lid off and have learned they aren’t the best for my kindergartener seeing he told me he spilled his snack everywhere trying to get it open. my next step is probably linen napkins around here. i want to be done with paper napkins and i seldom buy paper towels. so, i wasn’t sure i could do this no plastic baggie thing for the packing of 3 lunches daily and i was sure i would cave so…i’m patting myself on my back! things i pack the kids for lunch…. Sitting in my rocking chair, away from the heat of the kitchen, as i wait for the canner to boil. 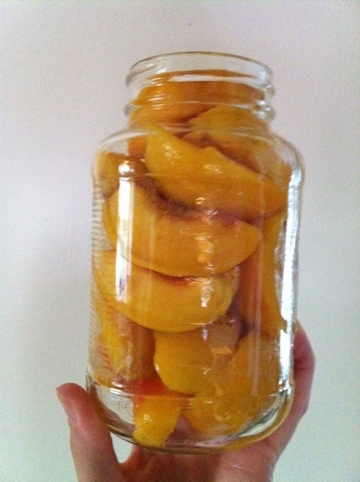 There are 5 quart jars & 1 pint jar packed with peaches from fredricksburg, texas that i got at georgia’s farm to market a few days ago. I picked up a case & most will be canned & used to help make the (two) kids school lunches come fall & winter. Seamus enjoyed the few peaches and pears i canned last year. Layla not as much but she will come around. Starting in the fall between two kids in school fulltime (and a husband who packs his lunch daily for work) a mom is going to need a stocked pantry! Don’t these peaches look delicious? Can you see those fragrant, tasty spices floating around? If not, trust me. They are there! 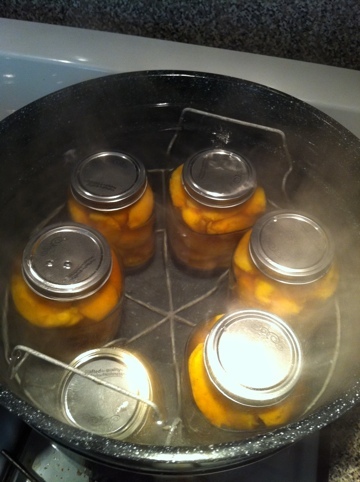 I was happy to see that all the time it took me to boil, chill, peel & quarter the peaches paid off! My canner was full. 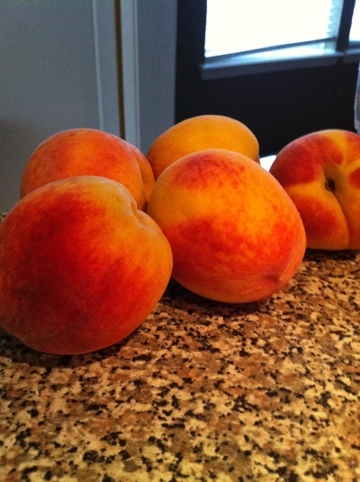 After i make a pie i will have some peaches left over. 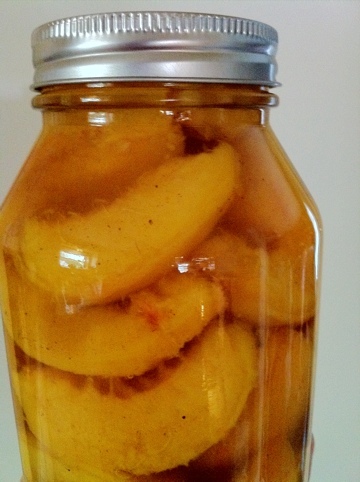 I am thinking of canning some more to get me a couple pints then i am thinking about making some peach puree. I can see meyself using it to make up some…. peach crepes, perhaps? 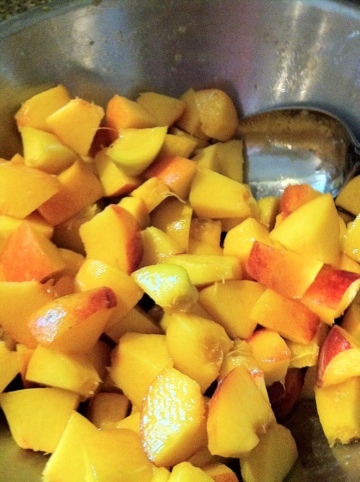 I would also like to make some peach jam or peach preserves… I am still undecided. I suppose i should put some freezer. (just thought about that.) i mean i could make a blueberry peach smoothie!! Oh boy…there are just too many possibilities. Maybe i need another case? ….So, i got distracted with other things & had some time to think about what do with the rest of the peaches. I decided to freeze them all using the foodsaver. (boy did get lucky with it!) i decided if i freeze i can use for smoothies & if i wanted to i can thaw and cook them down into a peach sauce or syrup and make crepes with them. So, they are all in the freezer. I diced them up and put some lemon juice on them. I left the skins on because no matter what they get used for we won’t mind the skin. 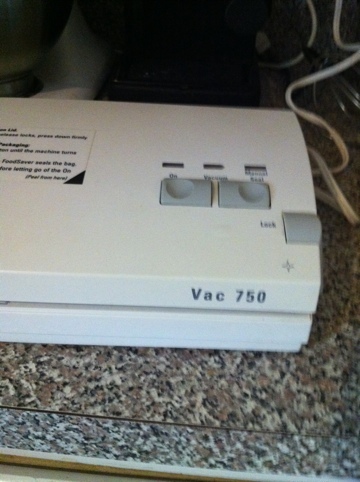 Then i used the foodsaver…by the way, my bestie found this at a garage sale for $15. She wasn’t sure it had all the parts & there was no manual with it so she told them she’d pay $5 and i have used it so much in the past few months! Nothing fancy but it works great and i can seal up large and rather small quantities of food now that i know how the thing works. 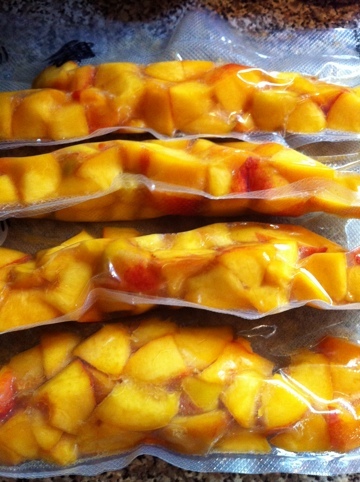 Now i have delicous fresh texas peaches, perserved as soon as they were ripe, in my freezer! 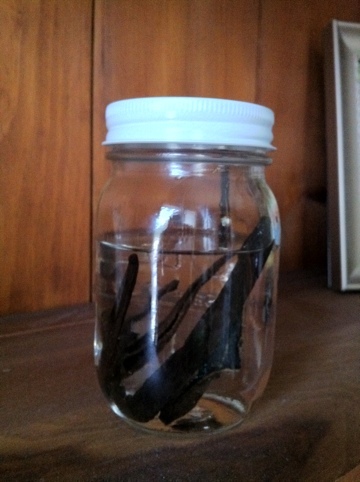 The other day my mexican vanilla beans came in the mail & i put them in vodka & put it away in the cupboard for the next 6-8 weeks! I am so excited to start using it in my baking. give THIS pasta salad a try! so, i frequently check out to see what the pioneer woman has been up to…what she’s been cooking. if i could i would probably try 95% of her recipes. they are all just simply divine. i saw this recipe for THIS pasta salad the other day and went right out and got myself some smoked gouda, and the adobo peppers, the only ingredients i was missing. i mean i had cherry tomatoes and basil from the garden so WHY NOT make it? i whipped it up, gave a taste test…ok maybe a few and put it in the fridge. i sent it work with geoffrey the next day and he said it was the best pasta salad he had ever had. actually i think he used the word ‘awesome’! he has had many pasta salads over the years and just doesn’t care for them. i liked this one because even though it called for mayo it wasn’t laden with bunch of it. your traditional macaroni and potato salads just have too much and i don’t want all the fat. this one i knew would be bursting with a melody of flavors! every once in awhile the pioneer woman invites people to their lodge on their ranch in OK for a weekend of cooking. that would be something! so, you take a look at this delicious recipe and i am going to go make some blueberry crepes! the love my life has requested them so…off i go! scratch that…the pie is first! i forgot. silly me! i (we) have been seeing LOTS of blue the last week! on thursday the kids and i went and picked almost 13 pounds of blueberries! we were enjoying them all weekend. i made jam, we had a fresh (no baking required) blueberry pie, lots by the handful, in a fruit salad and some in the freezer. i really wanted more and geoffrey was off yesterday and said he’d love to go pick with us…so off we went! this is the 2nd year we have picked blueberries from moorhead blueberry farm in conroe, texas. they have about 20 acres of blueberries on their farm that is if i remember right about 30 years old (?). they haven’t used pesticides/chemicals/yucky- bad- stuff you don’t want on your berries which is exactly what we wanted!! hard to find. and…they are a u-pick only farm, provide buckets for picking, they bag up the berries for you, have multiple restroom facilities, shady bushes, a sno-cone stand (that we learned isn’t open in the late afternoon/evening when we go) and very friendly staff. oh, and the berries are $2 a pound! we shall return there every year for as long as we can! the last batch of jam is in the canner right now! i’m wanting to bake a delicious blueberry pie. i was hoping to do that today… if not today, tomorrow for sure! the kids have become quite the blueberry pickers. we picked a little over 12 pounds with geoffrey and got done fairly quickly. with the extra set of adults hands i had less stems to weed out this time around 🙂 seamus just asked for a sunbutter and blueberry jam sandwich! i made our jams with honey only. just enough to make it sweet. this year i am using a texas honey but next year i am hoping to be using our very own barry farm honey! that will be awesome! 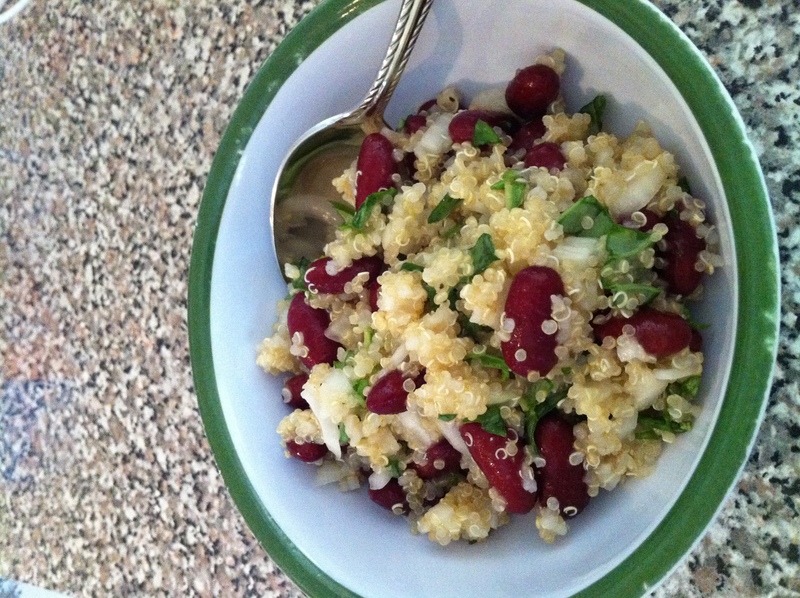 in a large bowl mix your beans, cooked and cooled quinoa, onions and basil (or cilantro). whisk together the oil and lime (or lemon) juice. pour over salad and mix well. throw in some feta cheese if you’d like! i love this…. i just put a batch of homemade granola bars in the oven. i should have made them before the crazy busy weekend hit! as i was making them i couldn’t remember if i had shared them here. i know i posted on Facebook and three people i know have been making them and loving them! i searched for awhile and tried out some different recipes but, this was the keeper. at first i wasn’t sure about this recipe with the egg and flour. i promise you…they are delicious and versatile. sometimes i add unsweetened shredded coconut and/or pumpkin seeds. mix all the dry ingredients, add the wet ingredients and mix well. 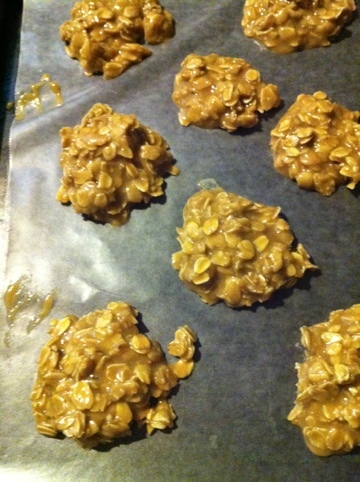 let them cool…try not to eat too many! i need to do better about keeping them on hand, especially when we busy and on the go. they are easy to take along. i use this quick quiche recipe often. we all enjoy quiche and it makes for a quick and easy supper. i never have bacon around to put in it. sometimes i add other things to it & i use whatever cheese i have on hand. i serve it with a veggie and fruit, usually. i’ve always loved quiche and was so happy when i found this simple quiche recipe that doesn’t require a crust. i’ve been adding fresh herbs from the garden…yielding delicious results! basil and oregano to be exact. my quiche always seems to take a bit longer to bake than the recipe says.